Improving the skills of young people in modern languages ​​is at the heart of our concerns because today to speak at least two languages ​​is not an option but an imperative. However, to learn a language you must speak it and preferably with someone who is a native speaker. It is from this observation that JEUNES DIPLOMATES developed its programmes and pedagogy. All year round we offer private lessons , group lessons or revision weeks to avoid bad marks and giving up at school. We also prepare your children and teens for the Cambridge English exams. In summer and winter, our language camps in an exception setting are designed to allow children and teens to continue their progress while enjoying their holiday . An effective education method taking into account the age , motivation and personality of each student, JEUNES DIPLOMATES has created specific programmes for children and teenagers from 7 to 17 years, from around the world to learn English or French . A multi-cultural and multi-lingual environment. It’s by talking that you learn a language. However, in a “traditional” environment, who do you talk to and what about? For JEUNES DIPLOMATES, communication is a key word and we have implemented the necessary conditions so that the students are “obliged” to speak a language other than their own. In fact, children and teenagers come from all around the world (United States, Russia, Europe, Brazil …) and the sports and cultural activities allow them to speak a language other than their own. In addition, this mix not only promotes learning but also the discovery and exchange of cultures. To be effective, group lessons and language courses bring together groups of 8 students maximum, separated by age and levels. Our teachers are all experienced and native speakers and the sports activities are run by mountain professionals. Nothing is left to chance and the security is one of our main priorities. Our summer and winter language summer camps take place in Megeve, a French ski resort of international renown. 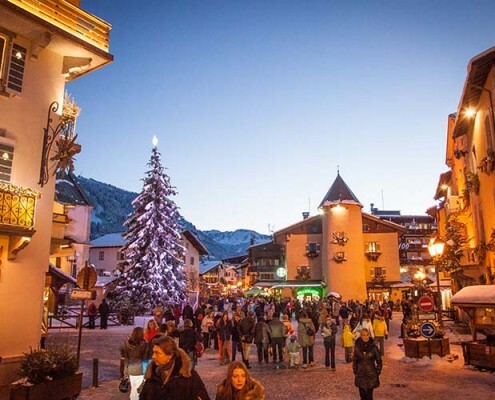 A preserved village full of charm, Megeve is located in the heart of the French Alps at 1113 meters and combines the charm and elegance of a winter and summer sports resort and a true Savoyard village rich in history and its people. In summer, Megève invites you to take part in hiking, mountain biking, horseback riding, not to mention the thrill of air or water sports. The village is ideal for a holiday in the great outdoors ! The ski resort of Megeve is located in the Alps, close to Switzerland and Italy.